Composition titled "SMILE" Based on poem by Ian Loughran. Four acclaimed poets, David Eggleton, Ian Loughran, Emma Neale and Sue Wootton have had poems scored and arranged for singing. Hear new compositions inspired by the poetry being by leading New Zealand composers including Anthony Ritchie and Jeremy Mayall. 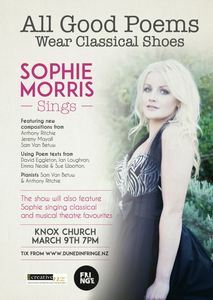 Art forms of Poetry, Classical music, Opera merge into new and inspirational creations sung by Soprano Sophie Morris. The event will also feature readings of the poems by the poets themselves so the audience can compare and contrast the original work with the new creations. Travel with them all on a journey of creative discovery for an inspirational and entertaining evening at the historic Knox Church. 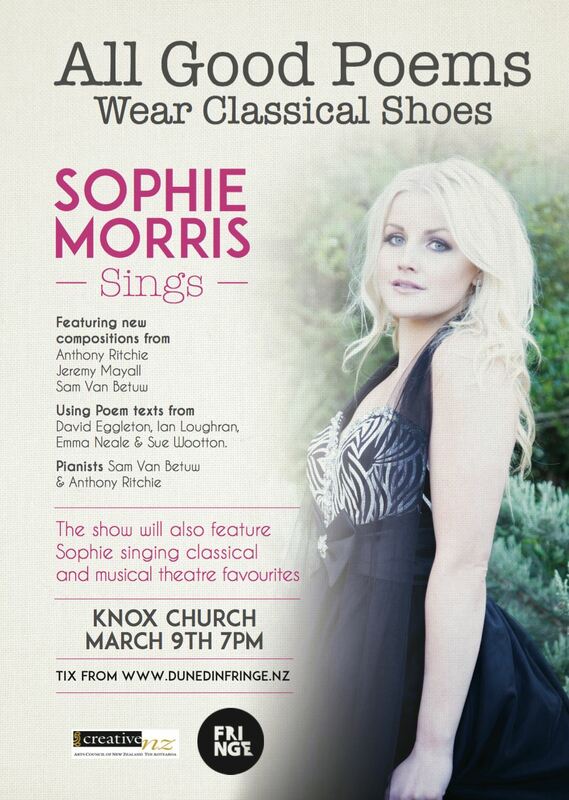 To complement the new creation work the event will also feature some favourite arias and show tunes sung by Sophie as well as the poets reading a selection of their best work. Truly and evening with something for everybody whether you are a fan of Opera, Musical Theatre, Poetry or enjoy the fusion of different art forms. Witness exceptional artistic practitioners push themselves with new work heard for the first time at this performance.